Drifting Fog, Hills. © Copyright 2019 G Dan Mitchell – all rights reserved. 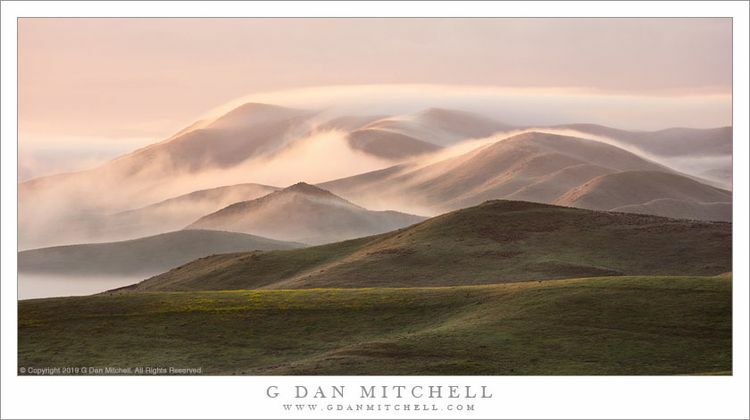 Dawn fog pours across arid California hills. Sometimes I end up completely throwing out my photographic plans for the day. When I awoke in the pre-dawn darkness on this day, I intended to head down from camp to a plain and lower hills where I would photograph spring wildflowers. I fixed coffee and had a bowl of cereal in the dark, loaded up my vehicle, tried to sneak out of camp without bothering the “normal” people who sleep in, and heading down the gravel road. As I drove it began to look like the valley was, to my complete surprise, completely socked in by thick fog. Before entering the upper limit of the fog I stopped at a turn on a hillside from which there was a panoramic view. Far to the southeast I saw that the fog was even in the mountains, and that gentle morning breeze was apparently pushing it up and over a series of high ridges just as the first reddish light of dawn intensified. I quickly put my wildflower photography ideas on hold and went to work photographing the ephemeral fog and light.